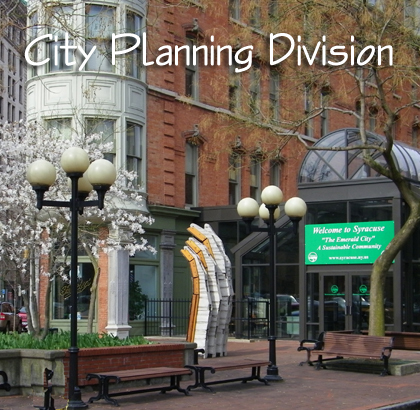 The City Planning Division is responsible for the planning, coordination and execution of the Mayor’s sustainability initiatives, major planning and urban design projects, and both intradepartmental and interdepartmental administrative and planning efforts to ensure consistency with and progression of the Mayor’s agenda. This Division is charged with advancing sustainability initiatives including but not limited to those pertaining to energy, clean air, clean water, stormwater management, smart growth, green building, natural resource protection, environmental advocacy and education, as well as interaction with local, state and federal agencies such as the New York State Department of Environmental Conservation (DEC), the New York State Energy Research and Development Authority (NYSERDA), the US Environmental Protection Agency (EPA), the US Department of Energy (DOE), and other governmental and non-governmental agencies. This Division is charged with the creation and/or implementation of plans and other administrative tools related to land use, zoning, historic preservation, public art, brownfield management, and urban architectural and landscape design. Additionally, the Division will work with individual City departments to assist in the creation of plans that will help guide operations in the most effective and efficient manner. Concurrently the Division will work to make sure the plans and guiding documents being used by different departments are well coordinated with each other and are in keeping with the Mayor’s agenda. Click here to view or download the plan. This is a large file (pdf, 75 MB).